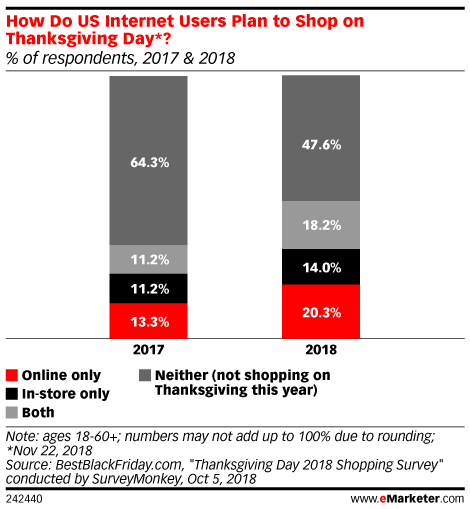 Data is from the October 2018 BestBlackFriday.com "Thanksgiving Day 2018 Shopping Survey" conducted by SurveyMonkey. 1,069 US internet users ages 18+ were surveyed online on September 30, 2018. Respondents were female (54%) and male (46%). Respondents were ages 18-29 (24%), 30-44 (24%), 45-60 (31%) and 60+ (21%). The margin of error is +/-3.1 percentage points. There are currently around 254,431,737 adults over the age of 18 in the United States, according to Census.gov, and that figure was used for population calculations. BestBlackFriday.com is a media source providing shopping news for Thanksgiving and Black Friday shoppers.